Hazel and her crew on the "Argo II" have a choice to make: to bring the statue of Athena Parthenos back in order to stop Camp Half-Blood and Camp Jupiter from warring with one another; or to sail on to find the House of Hades and attempt an impossible rescue of Percy and Annabeth from Tartarus. Meanwhile Annabeth and Percy are trying to find the Doors of Death from the other side of Tartarus in order to stop the vengeful Earth Mother Gaea from rising to power. Reading Counts: Level 4.2 / 22.0 Points / 61954. 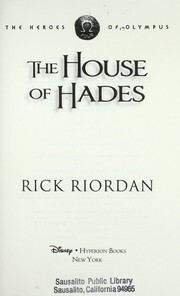 The house of Hades (#4 Heroes of Olympus) Rick Riordan. Accelerated Reader MG 4.8 19.0 162104. Reading Counts RC 4.2 22.0 61954. Riordan, Rick. Heroes of Olympus ; bk. 4.